Bariatric Walking Frame For Users Up to 35st. Designed for the larger framed individual, this bariatric walking frame is heavy duty, but not light on features. 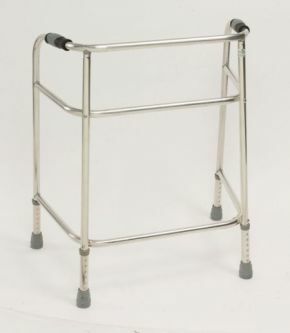 It’s a reinforced, aluminium constructed bariatric zimmer frame that assists and encourages movement of users up to 35 stone. Being made from aluminium means of course that it is lightweight but robust and sturdy. 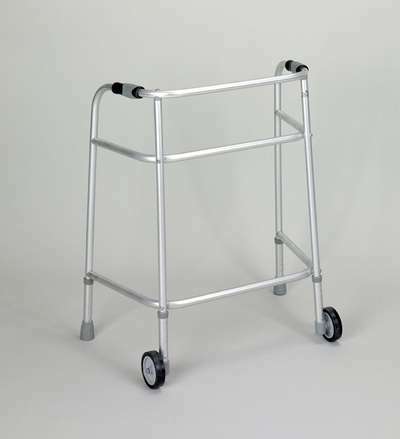 The walker is available with or without front wheels (see pricing) and can be set up to the user’s preference. The non slip ferrules at the end of each leg provide reassurance and confidence, while the solid rubber grips are both comfortable and secure. This walker would be appreciated by anyone looking for a bariatric walking aid, and its use will encourage recovery and progress. Height adjustable in 20mm (3/4") increments.